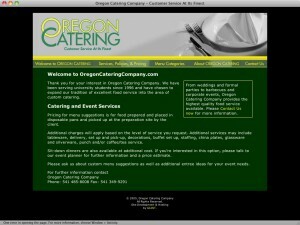 This static site comprised the online marketing efforts of a custom catering company. Site built to allow user easy access to sample menus and ability to manage large library of food photographs, highlighting their foodservice menu and showcasing presentation options. Although I have several (neglected) personal blogs, I've never done much writing about my professional life. With this new revision of my site, I'm aiming to do some more regular writing about technology-related topics. When I do, there will be a Blog section and recent posts will show up here. Keep watching this space! Thanks for visiting my site. I’ve been a freelance web developer for over two decades and I enjoy what I do. This site's design began life as the Linen theme by the excellent folks at The Theme Foundry. The body font is Droid Serif by Steve Matteson and the headline font is Lato by Łukasz Dziedzic. Both fonts are made available via the Google Webfonts Repository. The header logo font is based on the typeface Bifur by Cassandre. Copyright © 2019 G. Trout. All rights reserved.